Battleship IOWA Museum is a great venue in San Pedro, near Long Beach to have a picnic, catered event, meeting, or outing and her crew welcomes you and your special event guests to celebrate upon her teak decks, whether in the quiet shade of her officer’s verandas or in her stately wardrooms. 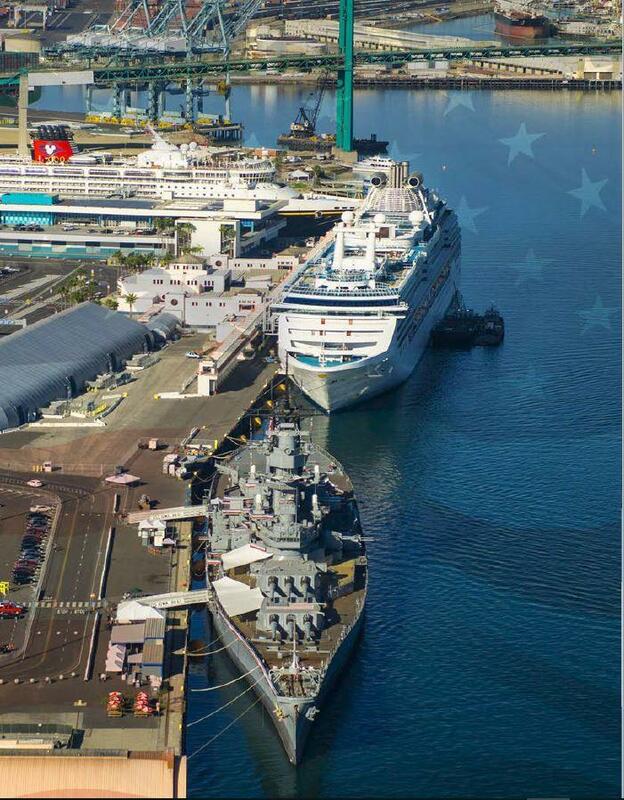 In 2012, IOWA arrived at the Los Angeles Waterfront and is a vital touchstone of the region’s naval and maritime history. Now, you and your special event guests can create your own memories aboard this proud and historic man-of-war. 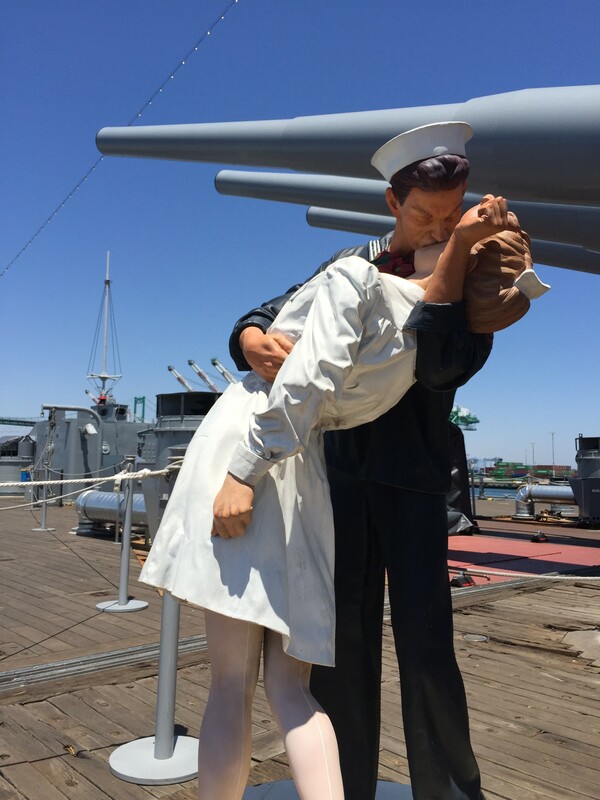 Battleship IOWA is a monument to American ingenuity and engineering innovation, and her crew welcomes you and your special event guests to celebrate upon her teak decks, whether in the quiet shade of her officer’s verandas or in her stately wardrooms. Groups of all sizes are easily accommodated on IOWA, and your private or public event guest will long savor their experience with you aboard the Battleship of Presidents. When you host an event on IOWA, you help realize this vision by bringing the iconic ship to life, as your guests are treated to a unique venue in the heart of the Los Angeles Waterfront. Proceeds earned from events held aboard IOWA are invested by the Pacific Battleship Center in the restoration and preservation of the ship’s proud heritage. Guests at your event will walk along the same teak decks and interior passageways as did three U.S. Presidents, Fleet Admirals William “Bull” Halsey, Ernest J. King and William D. Leahy, and Generals of the Army George C. Marshall and Harold “Hap” Arnold. Your guests can arrange tours in conjunction with your special event. 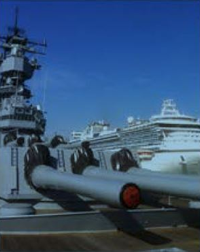 Along the tour route, they will be awed by IOWA’s 16″ main guns, visit the crew mess decks, and take bedside photos where FDR rested on the voyage to the historic Tehran Conference. Your special event aboard IOWA will certainly leave a memorable impression on your guests! Standing guard along Berth 87, IOWA evokes the proud naval and maritime heritage of the historic Los Angeles Waterfront. From 1919 to 1940, the San Pedro breakwater was home port to the U.S. Battleship fleet along with its dozens of cruisers, destroyers and support craft. Today, IOWA is moored astride the nation’s busiest seaport. Pleasure boat marinas dot the water front; your guests will watch as sleek sailing craft and massive cargo carriers slip through the channel under the soaring towers of the Vincent J. Thomas Bridge. Barely a mile from the southern terminus of the 110 Freeway, and just off the 710/405 Interchange, Battleship IOWA is easily reached by freeway from the San Fernando Valley, Westside Los Angeles, South Bay, Downtown Los Angeles and Orange County. Neighboring convention centers and family attractions make IOWA convenient to any Southern California vacation destination or business gathering. 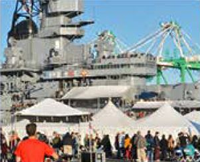 Your guests will enjoy the gentle seaport climate that caresses outdoor special event locations aboard Battleship IOWA. Concerts, weddings, military ceremonies and corporate functions are seamlessly hosted at the ship. From the fantail views of the LA/Long Beach Channel to the sweeping vistas of Palos Verdes and Long Beach from her upper deck verandas, IOWA’s special event venues are breathtaking. Indoor settings evoke naval history and understated maritime grace: Officer’s Wardrooms, In-Port Captain’s Cabin and other unique surroundings will leave your guests buzzing with excitement and wonder. Gatherings aboard Battleship IOWA will convey to all her guests a backdrop of quiet strength with a uniquely American accent: Born of war, witness to war’s end, the ship is at once a monument to both the nation’s commitment to victory and its devotion to peace. The Battleship IOWA starboard profile raises a dramatic backdrop for the outdoor venue. Your guests will relax in an expansive, casual setting that is ideal for barbeques, small festivals and other midsize to large group gatherings. Dockside events are perfect for family-friendly events, and the sunsets over Palos Verdes are striking! Think of the fantail as IOWA’s back porch: A large open space with 360 degree views of the ship, Vincent Thomas Bridge, LA Harbor, Palos Verdes and San Pedro. The fantail is the most popular event venue, offering great flexibility and easy access from the dock. Bands, dance floors, buffets and bars are comfortably situated on the wide teak deck – all open to the sky. For a more intimate ambience, the fantail is easily equipped with a partial or a full tent. FDR and his War Cabinet took in the sea air from this open venue while sailing to the Tehran Conference in 1943. 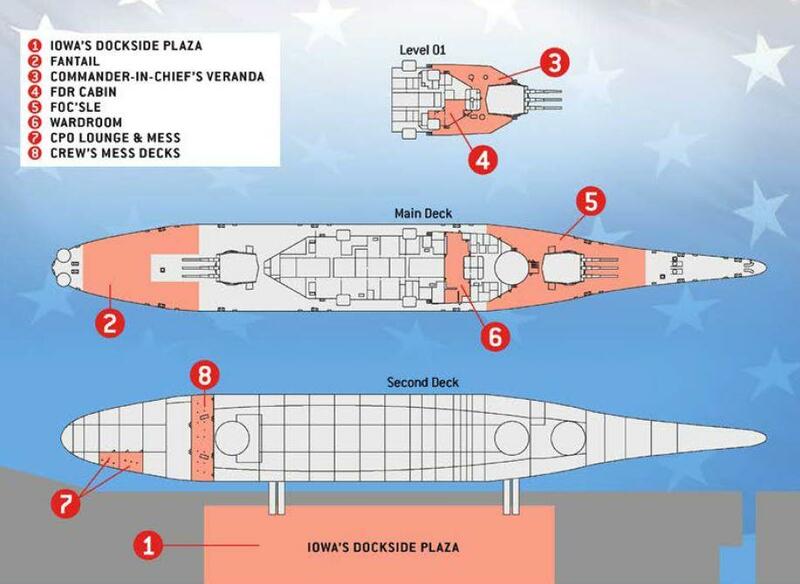 The Commander-in-Chief’s Veranda features teak deck planks, porthole exterior backdrops and railings overlooking IOWA’s massive 16″ guns. The historic venue provides an exclusive “upper deck” site – a comfortable, yet stately setting for midsize to smaller groups. 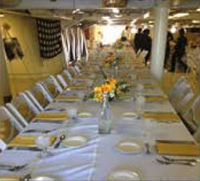 Battleship IOWA’s most exclusive special event venue served as the in-port Captain’s Cabin for three tours of duty. FDR’s Cabin overwhelms visitors with its historical significance; the cabin is a striking artifact of IOWA’s unique role in American history. 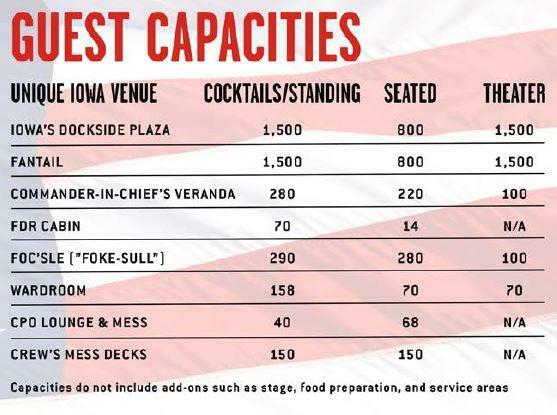 This venue immediately adjoins the President’s berthing space, and your guests will sip their cocktails at the table where FDR approved D-Day plans and relax in the lounge space where the President and his five-star military chiefs watched movies after dining. 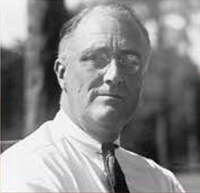 The FDR Cabin directly connects your special event guests with some of America’s most influential figures. Since before the days of Admiral Nelson’s Royal Navy gunboats, the foc’sle was the site where the ship’s would muster – and in early times, where the crew would bunk down at sea. Aboard IOWA, the foc’sle is an open-air special event venue immersed in a unique maritime setting. Anchor chains and windlasses line the teak forward deck, shaded by the turrets of her mighty main guns. The forward decks slope gracefully downward from teh bow, affording special event guests their best view of her imposing superstructure. Mid-size and larger receptions are ideal on this unique, visibly striking venue. 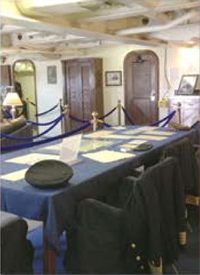 The most formal setting for crew dining, the wardroom was where generations of junior officers were served by white-clad orderlies. 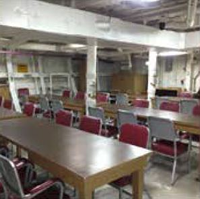 Your special event guests will long remember the spacious and open atmosphere of IOWA’s wardroom. Easy sightlines accommodate speaking programs and award presentations against the nautical backdrop of large portholes with heavy brass fittings. The Chief Petty Officer (CPO) occupies a storied and highly-respected position in Navy hierarchy and custom. These natural leaders of the enlisted crew were salty, experienced and knowledgeable. Veterans and guests of military themed events will feel right at home – even though this space was hallowed, and off limits to all but the tight fraternity of Navy Chiefs. Your guests will settle comfortably in this “club” atmosphere, perfect for small to mid-size gatherings. 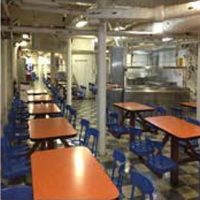 Your special event guest can “grab some chow” at the same tables as did generations of Battleship IOWA sailors! This ruggedly attractive venue is evocative of chowtime for IOWA shipmates, after-hours “scuttlebutt” or poker games. Dozens of tables and generous interior space gives your special event flexibility for casual dining, breakout groups and fun gathering spots. Adjoining kitchen and cafeteria-style serving lines adds convenience for your catered event. 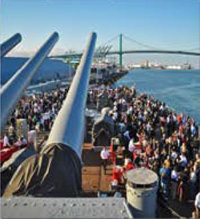 Bring Battleship IOWA alive for your special event guest by reserving an Exclusive Tour Guide. Many of IOWA’s Tour Guides are US Navy veterans, and their personal insights will create a unique experience for your guests. When Battleship IOWA was an active Navy vessel, this was the spot for sailors to buy official IOWA stationery for letters home, IOWA ball caps, and new dungarees. Today’s IOWA ship store is an exciting source for all things IOWA! You can arrange a gift package for your special guest from among the many affordable sourvenirs stocked in the ship’s store. With advance notice, IOWA will extend the store hours for your evening special event guests. There are many areas of Battleship IOWA not yet open to public tours. Among these are engineering spaces, senior officer’s wardrooms, sick bay and the post office. Special VIP tours can be arranged for your special event guests. Please inform IOWA in advance if you desire a VIP tour. Your special event guests will cherish their time aboard – make the memories last with professional photography. IOWA’s own Photo Intel crew can create fun backgrounds for your guests, or help you select distinctive settings aboard IOWA for group or individual shots. other opportunities to make your event highly successful and memorable. For more information on how to reserve Battleship IOWA for your special event, please contact events@labattleship.com or click here and fill out the form.